about this book: A collection of eleven short stories. Any of the stores read by two or more people should provoke discussion. They are modern fables and tall tales infused with satirical humor and poetic license. I am now retired after owning and operating The Screen Actor's Studio in Victoria B.C. for over thirty years. During the studio period i was hired for writing video scripts and lyrics. Many of the songs were recorded but NOT always the best of them!. After quitting the studio at the end of 2015, i organized my archive files and spent time developing plays and a number of the ideas and scripts seemed more appropriate to turn into short stories. Difficult to put a time frame on how long it took me to write. The main title story is the longest, 90 pages, and the only one written after i had decided to make a collection to publish from earlier writings. The cover came from an idea i remember reading by an author. He wrote of making specific choices in designing a memorable cover, that had little to do with the content of the book. 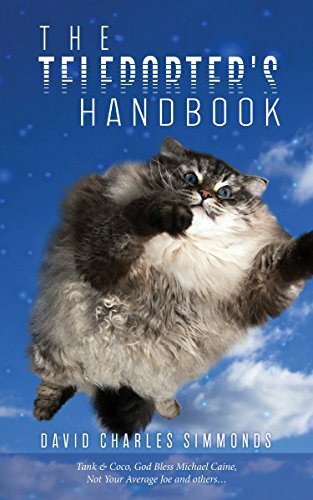 However, in my book the main story does have a cat that appears to be flying. And; I should add my choice of cover has been a major success! There was a lot of research involved and drafting / editing before i felt the book was ready. For readers of The Teleporter's Handbook, it confronts issues concerning the present world we live in. Questions for them to consider and while doing so, it puts a smile on their face.